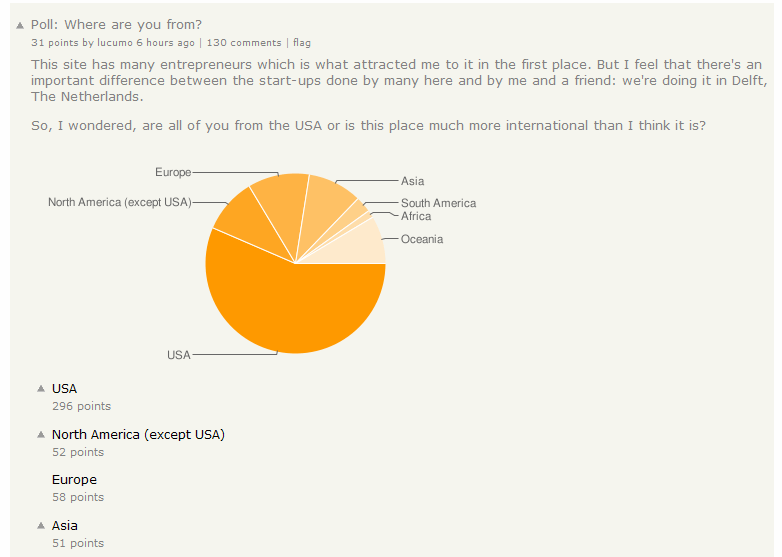 I made a bookmarklet that embeds pie charts into Hacker News poll pages. It scrapes data from a poll page and creates a chart using Google Charts API. Note: Scraping is pretty fragile, it can break with any change of HN's html formatting. When you are on some HN poll page, clicking on this bookmark should create a pie chart just above the poll options. That's pretty cool. Any chance of making it a GreaseMonkey script so it will be done automatically on HN? I did notice a little bug, though. If you've started a poll, it thinks the * marker of your own vote is a poll option. I didn't happen to me on other polls, just on the one I started. Thanks for noticing. I never started a poll, so I don't have a test case. I made a fix based on how the * marker is rendered elsewhere.